The last time Happy Pets players got a glimpse of the Crowdstar Cat was in April, where Crowdstar gave it away as a Limited Edition pet during the 5th and final day of its first Fan Appreciation Week. 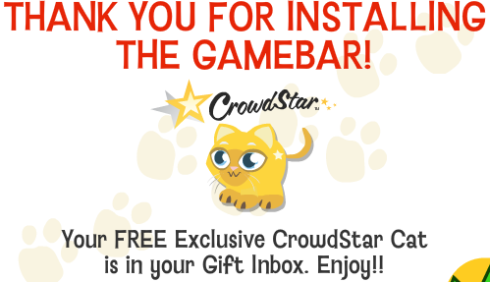 If you missed out on the free star-studded kitty by failing to log-in on Day 5, installing the Crowdstar Gamebar now will give you a second chance. The instructions to get your Crowdstar Cat are identical to getting Happy Aquarium's Rare Rainbow Shark, so I recommend you read our guide for that one here. Only, instead of logging into Happy Aquarium when your installation is done, you should log into Happy Pets instead. For those playing Zoo World, logging in will get you a free Pink Sea Turtle. As for Happy Island, even after 3-4 reinstalls and uninstalls of the Gamebar, I couldn't get the free castle in the picture. It's possible that the game hasn't been updated to notice players who have downloaded the Gamebar yet, so sit tight and try again later.